The foundation stone of the fortress was laid on the 16th of May (the 27th of May by new style) in 1703. This is the day of St. Petersburg’s foundation. Peter I decided to build a new fortress on a small island. This island is called Zayachy (“Hare”) island. 'The legend says that Peter I marked the place for for­tress gates with two birch-trees. Zayachy island is situated at the point where the river branches out into two arms. The island made a good defence position. The fortress had to protect the lands of the Neva from attacks of Sweden. The fortress took its name from the small wood­en church in the center of the unfinished fortress. This church was dedicated to the Apostles Peter and Paul. Soon after that another fortress on Cronshlodt island was built and the Peter and Paul fortress lost its mili­tary role and turned into a political prison. Alexei, the son of Peter I, was one of the first pris­oners. The opposed Peter’s reforms and joined in a con­spiracy against him. Alexei was imprisoned and exe­cuted in one of the casemates of the fortress. The for­tress remained the most horrible political prison in Russia for almost 200 years. 'The writer Alexander Radishev wrote the book “Voyage from St. Petersburg to Moscow”. This book was directed against the tsar’s system. He was im­prisoned in 1790. Five of the Decembrists were hunged in the Peter and Paul Fortress. Their names are Pestel, Ryleev, Muravyev- Apostol, Bestuzhev – Rhumin and Kakhovsky. They took part in a revolt against autocratic rule of the tsar in December 1825. The writer Fyodor Dostoevsky was imprisoned in 1849. He was the member of the Petrashevsky Politi­cal Society. In 1905 Maxim Corky was imprisoned in the Peter and Paul Fortress together with some other revolu­tionary workers. In 1923-1924 the fortress became a museum of the history of St. Petersburg. Now a branch of the St. Petersburg Historical Museum is situated in the fortress. We can see bastions and cells where the political offenders were imprisoned. In the center of the fortress stands the Mint. It was founded in 1724ГCoins, badges, orders, medals have been minted there. 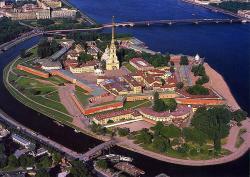 The Peter and Paul Fortress is a historical monu­ment of the 18th century.